Forgiveness is often spoken of, attempted by many, occasionally understood. Nan Brown Self unlocks the secret to experiencing and practicing this fundamental key to walking in freedom from our past offenses in her newly released book Forgiveness: Making Space for Grace (Brown Books Publishing Group, March 2017). Nan has a passion for applying the teachings of Scripture to everyday life and has taught on the subject of forgiveness for over thirty-five years. But it was her own exhaustion and load of emotional baggage carried far too long that brought her to the foot of the Cross. “Why do you continually bring your burdens of unforgiveness but never leave them there,” she sensed the Lord saying. In seeking to answer His question, she found fresh perspective on one of the most fundamental teachings of Scripture and more importantly, experienced the grace of forgiveness that left her “past” where it belonged ­ at the Cross with Jesus. Now everyone has the opportunity to truly understand and experience this same grace of forgiveness through Nan’s latest work. Forgiveness: Making Space for Grace is profoundly practical. With biblical insight, Nan helps the reader identify the roots of unforgiveness, experience healing of old wounds, begin the journey of restoring relationships, and maintain their walk in peace and freedom. Each chapter concludes with practical questions, a worksheet, and a prayer, making it ideal for study groups or private devotionals. Drawing from her personal encounter with the grace of forgiveness and the immutable truth of God’s Word, Nan charts the course to freedom from our past grievances and offers a prescription to maintaining that freedom on a daily basis. Bonnie’s faith while facing her nightmare reminds us that each of us can trust God with our faith, when our feet fail, the waters are turbulent, when a mountain looks too steep to climb, and when our heads are barely above the waves. Read more of Kimberly’s interview with Bonnie in Shout Lifestyle Magazine. As a speaker, Bonnie has shared her story with thousands of people across the country. Many of them can relate to the obstacles she overcame early in life. Bonnie was a young teenager when her parents divorced and her beloved father left. By the time she reached her 20s, she had grown accustomed to a feeling of abandonment. “It was obvious when people leave me, they don’t come back.” Bonnie remembers. “Every boy or man I had ever loved had broken my heart. 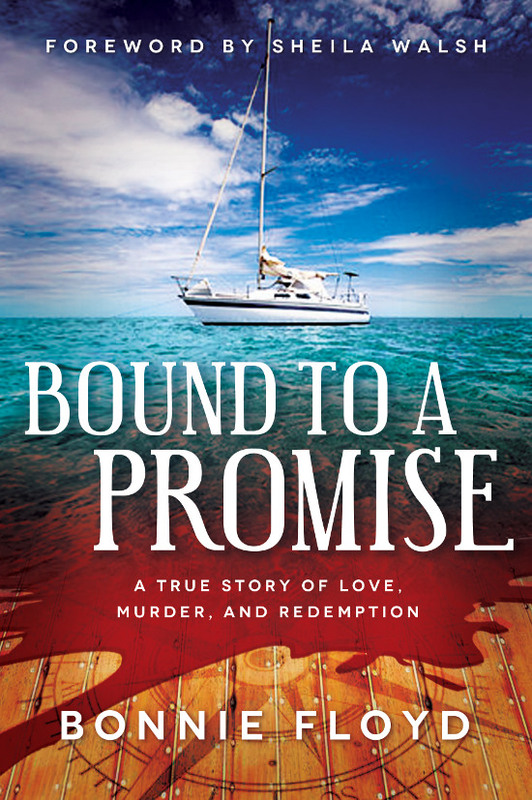 With a track record like that, I was in desperate need for unconditional love.” Bonnie finally found the love she was looking for when reading the Bible; her daily efforts to share the promise of that love with others are the common threads woven through each chapter of Bound to a Promise and what drives Bonnie in her life today. Bonnie Floyd has written a book that, while true, reads almost like a novel. Her word pictures enable the reader to experience the things she saw, heard and felt. It is almost like reading someone’s personal diary. At times I felt that I was eaves-dropping on very private moments. Not only is this a riveting story of intrigue and murder, it is also an inspiring story of redemption both with God and with fellow human beings. Along the way you will meet her father, Bill, her step-mother Kathy, “My Donnie” her husband as well as a variety of characters including Scotland Yard detectives, millionaires, statesmen, murderers, prison superintendents and more. You’ll need to set aside time to read because once you begin this book, it will hard to put down. Bound to a Promise is a must read. Thank you, Bill for sharing your musings,thoughts, and more about the book! Q: Your steadfast faith in Jesus sustained you through the horrific events, the sadness, and the courtroom. But that’s not how your own story began. Tell us about your journey to faith in Christ. A: I was not raised in a Christian home. My parents divorced when I was a young teenager, and my father eventually left me with my mother so that he could travel the world with his new wife. I loved my mother very much, but I had always been “Daddy’s girl.” I spent a long time trying to fill the void left by my father’s absence with anything that would fulfill me. By this time, I had a good job working in an optometrist’s office. My full-time job and my private life were polar opposites. During the day I was surrounded by wonderful coworkers whose whole lives revolved around Jesus—something that was completely unfamiliar to me. I was drawn to these Christian people, and I thoroughly enjoyed getting to know them. However, in the evenings and on the weekends I was surrounded by people who knew nothing about God; their entire existence revolved around partying. It was as if I lived a double life. I lived with a man 12 years my senior for six years—even after discovering he was married. I searched in vain for fulfillment that would soothe my soul. I began spending more time with Christian friends and my sister, who had become a Christian, as well, but I still wasn’t even sure who the one true God was, so I prayed and asked Him to show me. On the night that yet another man left me, I ended up at a Thanksgiving communion service at my sister’s church. It was there on November 26, 1986 that God answered my prayer. I trusted Jesus for salvation. I experienced His forgiveness, and my life would never be the same. Q: One of the most unexpected twists in the story was your decision to meet with Donaldson Samuel, one of the men who attacked your parents that night on the boat. Why did you feel drawn to this man? What happened at that fateful meeting? A: There is only one explanation for why I felt compassion for Donaldson Samuel: God spoke to my heart. Though Donaldson did not pull the trigger, he was the one who bound and gagged my parents, along with everyone else onboard. He made them helpless to escape. He was also the only assailant out of the three who told the truth—in fact, his testimony was key to convicting the two other men who actually carried out the murders. In the beginning, I found myself feeling sorry for him as he was berated by the attorney for the defense. Before long, I knew the Lord was prompting me to tell Donaldson about Jesus, but that was easier said than done. Nobody else was in favor of that idea—not the Scotland Yard detectives, the prosecuting attorneys, Donaldson’s attorney, or even my husband, Donnie. I was told there was no way I could even arrange a visit with Donaldson in prison. There was only one person with the authority to sign off on such a visit—the imposing Superintendent Mac. Everyone assured me he would never consent to a meeting. When I finally met the superintendent and made my request, I discovered he was an ordained minister. He was more than willing to let me come. Q: Did you ever see Donaldson Samuel again? How did the friendship you shared affect the people on the islands of Antigua and Barbuda? A: Very unexpectedly, I was able to visit him again one year after he received Christ. I think he was less surprised than I was that I returned so soon. “Bonnie, I pray for you come back,” was the first he said when he saw me. We continued our relationship and wrote one another for five years and then one day without explanation, his letters stopped. There was a ten year period when all communication went dark. Donnie and I made a trip to Antigua to find try and find him. To find out why his letters stopped and what had become of him. With the help of John Fuller, Antigua’s prosecuting attorney, I found him. He had served his 15-year sentence and was back on Barbuda. When we were reunited he introduced me all around the island as “his family.” I saw that even though he was a believer and I had forgiven him, he was still somewhat of an outcast because of the crimes he had committed. The people on Antigua and his home island of Barbuda simply could not believe that my forgiveness would lead me to come and visit him again and become adopted as family. All of Antigua and Barbuda was amazed by our story. Bonnie Floyd returned back to her hometown last week, and she had a story to tell. Hear the rest of her story by clicking here.